Where fire is sacred and the stars sing, a tribe lives in a secluded valley. Among this tribe are those given the first gift, the power to move earth and stone with their minds. Koll is one with this gift, he must leave the Valley to hunt a Stone Eater and take his father's place as the Moonwarden. No one expects him to return. 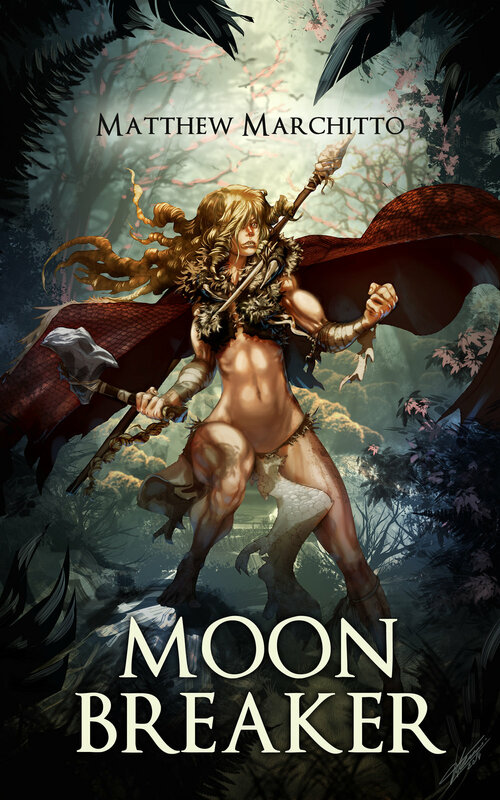 In Moon Breaker, Marchitto delivers a gripping, brutal portrayal of a society breaking down from within through a tribal fantasy adventure story that explores what happens to a society when its people abandon the values that underpin it. Moon Breaker raises significant ethical questions about how the value a society places on the wellbeing of the individual vs that of the collective, and the impact that value has on what is considered right and wrong. The events and characters of the story challenge the reader to think about what happens when common understandings of truth and right are actually based on lies, as well as when those lies are confronted and exposed, and the consequences this can have for individuals. Characters Koll and Nala are nicely written, and I was able to identify with both of them. Their actions and decisions came across as believable, and I found myself drawn in easily to their tale. This is a rich and imaginative fantasy, but it is not so unrealistic. It actually has sort of a pre-historic tribal feel to it, which is a nice touch.